The Greater Auburn Gresham Development Corporation is appreciative of all of the sponsors for our 2018 Benefit Dinner & Award Ceremony! Happy Holidays from Chicago Cares! 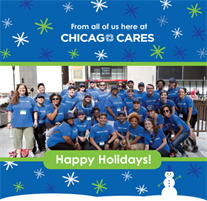 From all of us here at Chicago Cares, we wish you and yours a joyous and festive holiday season.